Registrations are now open for 7 to 10 days theory and practical training. Our classes are geared to the entrepreneur who wants to add different decorating and draping services, such as fabric draping, balloon decorating, theme props, or floral design to their offerings. 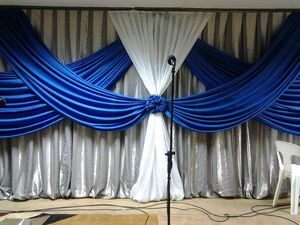 We offer training mostly to people who wants to start decor and catering business and be on events management industry. We also assist you by registering your company, designing your company logo, drafting a business plan & business profile for clients and tenders, and we create and design the professional Website for your business to be worldwide recognized. For more information regarding registrations, kindly drop us an email/SMS/WhatsApp, and we will contact you.